For the first time in a while, bond traders were carefully following today's Treasury coupon auctions, with the US Treasury selling a two-fer of 3 and 10 year paper, to see how easily the market would be able to digest today's supply. Moments ago the first auction, the sale of $36BN in 3-year paper priced, and while there were some negative aspects, it could have been worse. The auction stopped at 2.989%, the highest since May 2007, tailed the 2.987% When Issued by 0.2bps. 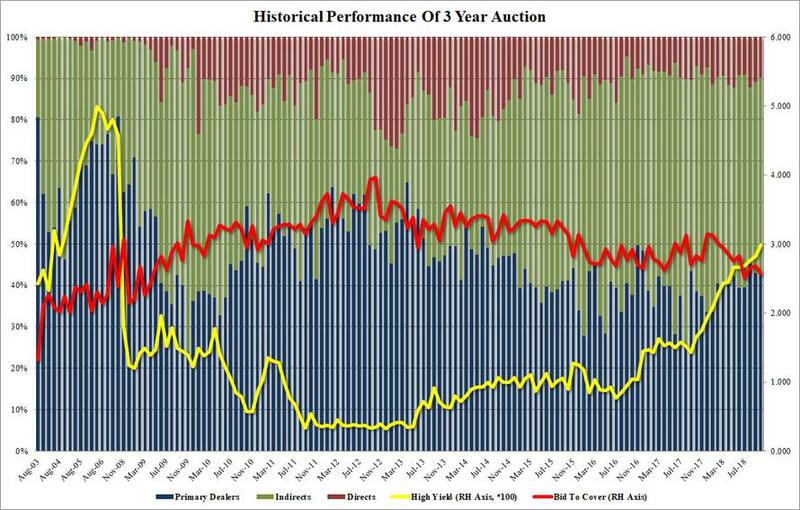 This was the 7th consecutive tailing 3Y auction, indicating that the market appears to have a bit of a grudge when it comes to this particular tenor. Another disappointing metric - the Bid to Cover of 2.56 - dipped from last month's 2.68, and was below the 2.71 6 auction average. The internals were somewhat better, with Indirects taking down 46.9%, modestly above last month's 46.3% if below the 47.5% average. Directs took down 9.8%, down from 10.7% in September and below the 10.6 six auction average, leaving dealers with 43.3% of the takedown, in line with last month's 43.0% and above the 41.7 average. Overall, a somewhat disappointing auction, but hardly as bad as it could have been had foreign buyers stepped away as some had feared. And now we turn our attention to today's more important 10Y auction at 1pm, which will have a far greater impact on both the yield curve and the bond market in general.